Shimadzu, one of the world leaders in analytical instrumentation, has released the AIM-9000 Infrared Microscope System. This automatic failure analysis system delivers a unique concept in the field of micro sample analysis. It offers automation of all necessary steps involved in failure analysis and micro sample evaluation; observation, definition of measurement spots, measurement as well as identification. With the AIM-9000, Shimadzu provides an analysis systems for all users, so micro analysis can be performed quickly and easily. The new system targets industries such as electricals and electronics, machinery and transportation, pharmaceuticals and life sciences, petroleum and chemicals. Contaminant Analysis Program identifies the spectrum automatically. AIMsolution can search with LabSolutions IR library with approx. 12,000 spectra, Tap-water contaminants library, Thermal-damaged plastic library, Sadtler libraries and STJ libraries. Furthermore, the AIM-9000 utilizes high-speed mapping measurement with imaging presentation. It is possible to observe visually and measure simultaneously. The AIM-9000 is controlled by the AIMsolution software which unifies all operations for sample observation, measurement and analysis. A wide range of accessories complements the instrument, such as objectives, polarizers, a pressure sensor and a TGS detector .The AIM-9000 will be compatible with Shimadzu’s IRAffinity-1S and IRTracer-100 FTIR spectrometers. In combination with the IRTracer-100 platform, the AIM-9000 can reach a S/N ratio of a staggering 30.000/1 (Transmission, MCT detector, 50 µm aperture, 8 cm-1 resolution, 2min. scan). 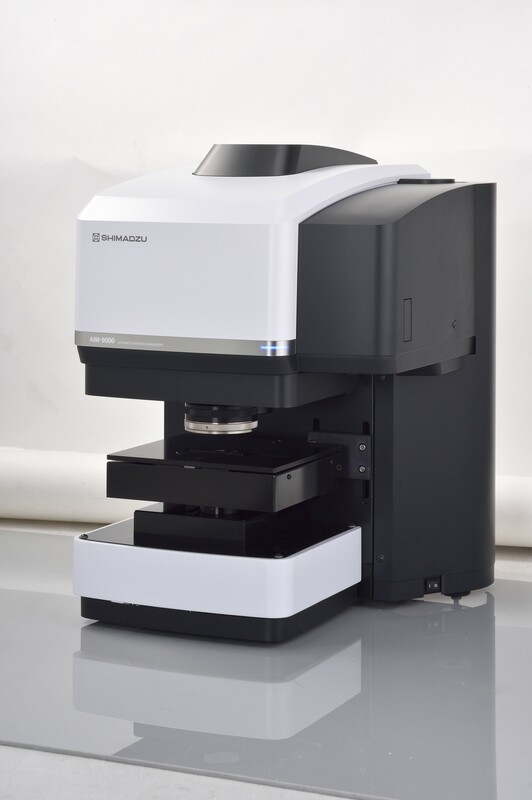 Shimadzu has released the AIM-9000 Infrared Microscope System. This automatic failure analysis system delivers a unique concept in the field of micro sample analysis. It offers automation of all necessary steps involved in failure analysis and micro sample evaluation; observation, definition of measurement spots, measurement as well as identification. With the AIM-9000, Shimadzu provides an analysis systems for all users, so micro analysis can be performed quickly and easily. Figure 1: The unique AIM-9000 Infrared Microscope System provides automatic failure analysis for industries such as electricals and electronics, machinery and transportation, pharmaceuticals and life sciences, petroleum and chemicals.